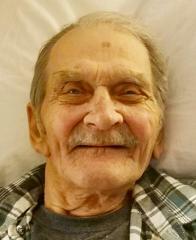 Albert C. McKee, Jr., 91, of St. Marys, OH died 6:10 a.m. Tuesday February 5, 2019 at his residence. He was born August 22, 1927 in St. Marys Twp. - Auglaize Co., OH to Albert and Margaret (Griewe) McKee, Sr. He was first married to Joyce Rees in 1950, who preceded him in death in 1982. Later, he then married Marlene Stephens, who survives. He was a graduate of St. Marys Memorial High School (Class of 1947). He served his country in the United States Army, having served as a combat medic during the Korean War. He was a member of the First Presbyterian Church and attended Shekinah Temple, both in St. Marys. Albert faithfully believed the word of God and that Jesus was his friend, His favorite pastimes included bowling, gardening, and collecting Native American artifacts. Albert enjoyed listening to music and was an accomplished harmonica player.More than anything else, he loved his family.